A recent survey confirms that black and white progressives are as starkly divided as the rest of the nation on how race shapes American life. As the progressive coalition has become more diverse, important questions about the intersections of race and class have emerged. Recently, the movement for black lives has challenged progressives over how a class-first narrative can obscure racial injustice. For instance, the progressive tendency to romanticize the mid-20th century as a “golden age” for workers obscures deep racial and gender inequity that existed then. A new survey underscores this tension, and suggests that the progressive coalition is deeply divided about the lived experiences of race and class. The survey, an Internet-based poll with a sample of 1,000 respondents, was performed between January 23 and 25. It asked a series of questions about how their race and class identity affected their lives in America. 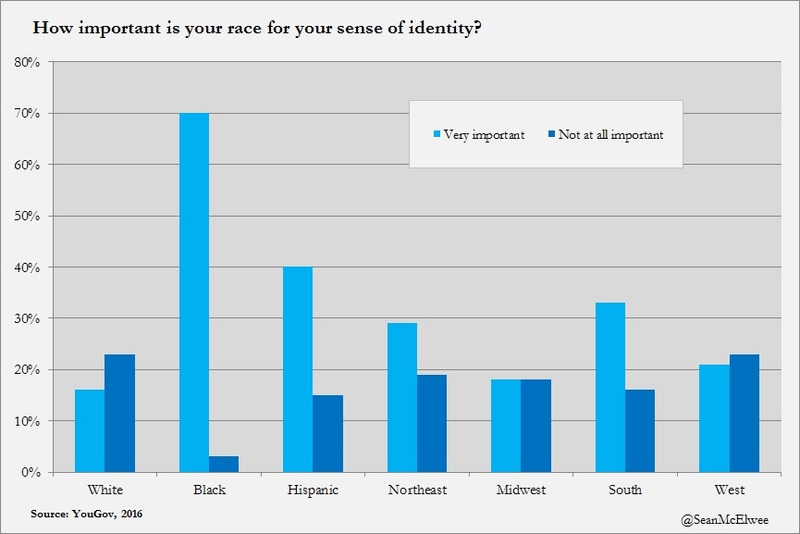 The survey asked respondents how important race is to their sense of identity, and offered five options: “very important,” “somewhat important,” “not very important,” “not at all important,” and “not sure.” Across the full sample, 26 percent said “very important” and 23 percent said “somewhat important.” There were clear regional divides: 33 percent of respondents from the South and 29 percent of Northeasterners said “very important,” compared with 18 percent of Midwesterners and 21 percent of those living in the West. But the deepest divide was by race itself: Only 16 percent of white respondents said that race is “very important” in their lives, compared with 70 percent of black respondents and 40 percent of Hispanics. 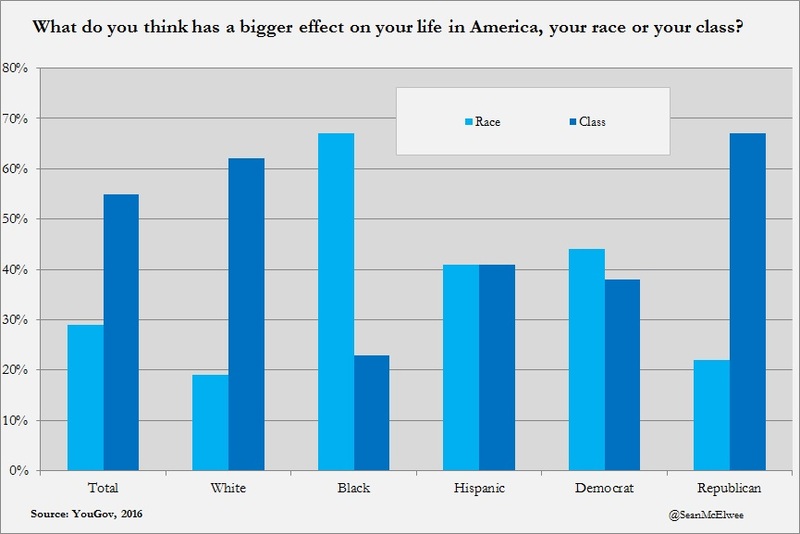 Respondents were also asked whether their race or their class has a bigger impact on their lives in America, or whether they weren’t sure. While the results were predictable, they were nonetheless stark. In total, respondents believed class to be more relevant than race to life in America. Just 29 percent of them said race had a bigger impact, while a majority—55 percent—chose class. But there were deep race and partisan divides on this question. White and black Americans have, essentially, opposing views. Among whites, 19 percent said race, while 62 percent said class (the rest said “not sure”). However, among black Americans, 67 percent said race and 23 percent said class. Among Hispanics, respondents were evenly divided. When looking at the question by political party, Democrats appear much more conflicted than Republicans—as you’d expect, given the far greater racial diversity among Democrats. Among Democrats, 44 percent said race has a bigger impact, while more than the 38 percent said class. 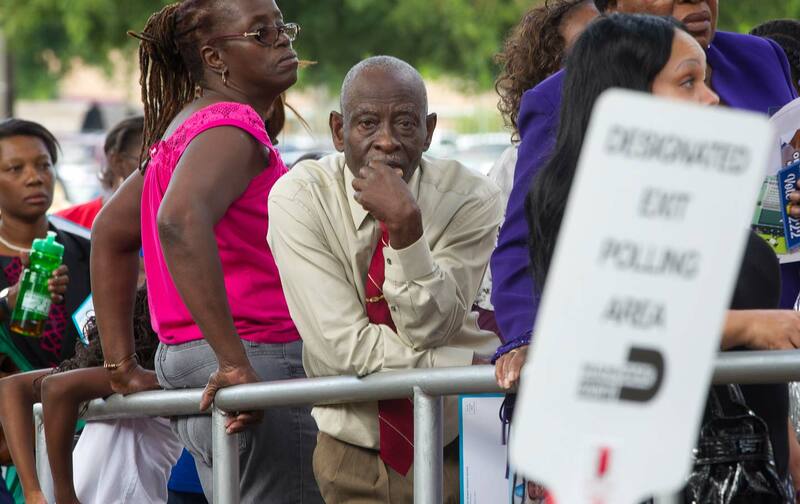 Among Republicans, just 22 percent said race and 67 percent said class. In order to fully understand how these divides would affect the progressive coalition, I asked Peter Moore, an assistant editor at YouGov, to provide me additional, exclusive data. 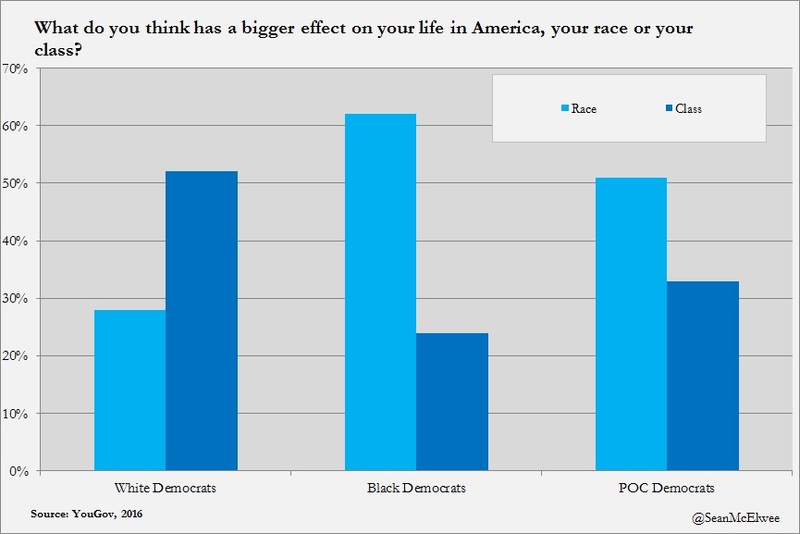 The data confirms that the same divide on race versus class that exists between black and white Americans overall exists within the Democratic Party, too. Among white Democrats, only 28 percent say that race is more important than class, compared with 62 percent of black Democrats. Among all people of color who identified as Democrat, 51 percent said race and 33 percent said class. It’s worth noting that the survey did not ask respondents how other identities—such as gender or sexual orientation—affect their lived experiences; these identities may even further complicate the race versus class question. However, the survey is an important first step toward understanding why a class-first approach may struggle to win over Democrats, particularly nonwhite Democrats. What the survey makes clear is that progressives need a narrative that addresses both race and class inequality together. The data also reveals jarring disconnects in the ways that Americans think about race and class in the context of government aid. As the chart below shows, very few Americans believe the government is doing “a lot” to help the working and middle classes (8 percent and 9 percent, respectively). Nearly a third say the government does “nothing” for either group, though more than half say the government does “a lot” for the upper class. On the other hand, 27 percent of Americans say the government does “a lot” to help whites, 41 percent say the same about African Americans, and 36 percent say the same about Hispanics. Of course, “working class” is an amorphous idea: Only 12 percent of those who earned more than $100,000 a year considered themselves “upper class,” and 8 percent of these six-figure earners actually considered themselves working class. Still, a majority of whites—52 percent—identified as middle class, compared with 39 percent of blacks and 41 percent of Hispanics. This self-perception squares with reality. According to Demos calculations, 53 percent of black households and 45 percent of Latino households are in the bottom third of the income distribution, compared with 32 percent of white Americans. And according to the Economic Policy Institute, 42 percent of Hispanic workers and 36 percent of black workers make poverty-level wages, compared with 23 percent of white workers. In contrast, according to sociologist Lisa Keister, whites make up 90.9 percent of the top 1 percent of earners. Thus, the idea that government is doing “a lot” to help blacks and Hispanics but “nothing” to help the working and middle class is rather confused. 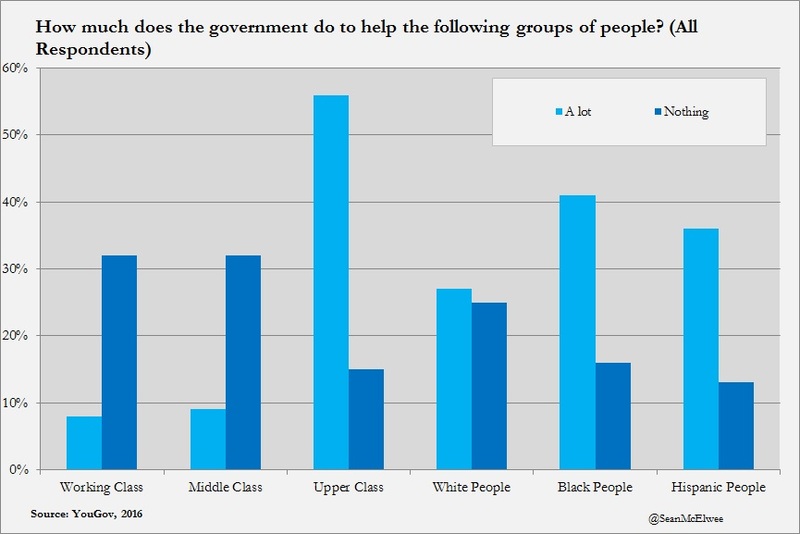 Similarly, though a majority of whites say the government does “a lot” to help the “upper class,” only 16 percent say the government does “a lot” to help whites—who overwhelmingly compose the upper class. In a recent Nation essay, Heather McGhee and Ian Haney Lopez offer a way for progressives to thread this needle. They note, “Conservatives have been working hard to convince white people that addressing racism is itself anti-white discrimination.” The solution, they argue, is for a narrative that “links, rather than counterposes, class and race.” This story would show that the “reactionary economic agenda made possible by dog whistle politics is responsible not just for the devaluing of black lives but for the declining fortunes of the majority of white families.” Indeed, the progressive movement must understand that race and class both deeply impact Americans, and that these issues must be addressed together. The time for a class-only progressivism is passed, and will fail to maintain the progressive coalition.